1. Candidates must have completed an Undergraduate Degree, including Tourism and Hospitality with 50% marks aggregate (can be relaxed by 5% for SC/ ST candidates). 1. The candidate must hold a Bachelor’s Degree of any stream including those of Tourism and Hospitality, with at least 50% marks (45% in case of candidates belonging to SC/ST categories). 2. Candidates should have appeared for any of the management aptitude tests viz., MAT/ ICET/ CAT. Intermediate pass or equivalent (10+2 stream)/ 3-years Diploma in Travel and Tourism/ 3-years Diploma in Hospitality and Catering Technology from any Govt. recognized college. High School Certificate Examination of the Cambridge University. OR Any Public School/ Board/ University Examination in India or in a foreign country recognized by the Association of Indian Universities as equivalent to 10+2 pattern of Senior Secondary education. OR HSC Vocational Examination. OR Senior Secondary School Examination conducted by the National Open School with a minimum of five subjects including English as one of the Subjects. For candidates from General and OBC categories, upper age limit is 22 years as on 01.07.2013. Candidates born on or after July 01, 1991 are eligible. 1. The selection is made strictly on the basis of merit. Selection would be through Group Discussion followed by Personal Interview for admission into MBA, PGDM program. 2. 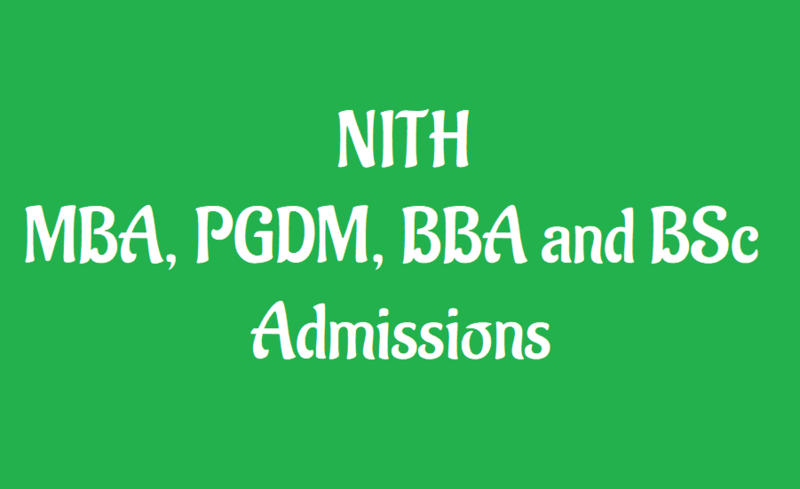 Candidate selection is based on their performance in NITHM Aptitude Test for admission into BBA program.